NICHOLAS DOLPHIN, B.A. (Hons), M.Sc. My paintings are a form of personal meditation and pleasure, and, in common with many artists, I feel that the “me” I inhabit on a daily basis could scarcely be the sole creator of the images. Martin Rees, the Astronomer Royal, writing in Prospect magazine (May 2012 http://www.prospectmagazine.co.uk/ ) says: "Our cosmic environment could be richly textured on scales so vast that our purview is restricted to a tiny fragment. We're not directly aware of the big picture, any more than a plankton whose universe is a litre of water would be aware of the world's topography and biosphere". Exactly - and I explore this idea directly in some of my paintings (see Gallery 2). I have come to realise that I am exploring the boundary between the seen and the unseen - where the unseen (with a nod to Donald Rumsfeld) appears through the objective world, the seen. Of course the unseen is greatly affected by my personal psyche through which it passes on its way to being made manfest. 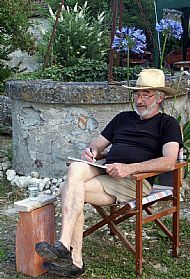 On the surface, and from the melting pot of many influences (see the Biography section), I paint local and inter-planetary landscapes, dreamscapes and imaginal journeys, as well as portraits. I start with a concept or an object or a few lines, then I paint from somewhere undefined within myself - keeping at the gate my rational/directive mind as much as possible and with varying measures of success. When I stand back from what I have painted, I am always surprised by what I see, at how the images have arisen and how they appear - and I learn another piece of myself. I am never sure of their precise meanings; I leave this up to the viewer. The titles give just one way of looking at the paintings, and I enjoy being surprised by people’s interpretations of them. To embrace the concept of the undefined origin of the paintings, their many influences and possible meanings, I invite your perceptions and interpretations. For example, you may be interested in the design and colour, the historical background, the intention of the artist, the subconscious of the artist, your own subconscious and mental frameworks, and so on. You will find some of my remembered influences in the Biography section, but I would particularly value learning about your perceptions and the possible meanings you find in my paintings. As I would like to make a compilation of them, please contact me with your thoughts via the Feedback page.